Set in the same universe as Planetfall, but not a sequel, this police procedural follows the son of the previous book's narrator as he navigates a capitalist dystopian Earth as an indentured servant trained in investigation. 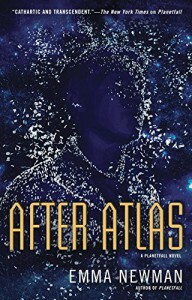 While some of the aspects of the prophet known as the Pathefinder may be vague without having read Planetfall, the details included are sufficient and After Atlas can be read as a standalone novel. This is a very different kind of story in a very different setting. The shape of the last act has something in common with Planetfall, which is interesting if you read both, but not necessary to enjoy either. As a murder mystery set in a high surveillance society, it's excellent. The start felt a little slow as the reader is introduced to life as a corporate asset (read: slave) and the protagonist's quirks, but once he'd assigned a case, everything was interesting. He knew the victim, the leader of a cult he left as a teen, but finds little recognizable in the man and the organization he remembers. And the last act went totally off the rails in completely the right direction. I did this as an audiobook and my house is much cleaner as a result of wanting to spend time listening.